Chicago authorities have released a dashboard camera video showing a white police officer shooting a black teenager 16 times in the city in 2014. Officer Jason Van Dyke has been charged with first-degree murder for killing Laquan McDonald, 17. Police say the teenager refused to drop a knife. Jason Van Dyke said through his lawyer and police union he had feared for his life. Chicago Mayor Rahm Emanuel has appealed for calm in the city. After the video was released, several hundred people held a march in Chicago, blocking traffic. During a tense but largely peaceful demonstration the crowd chanted “16 shots”. Police use of excessive force against African Americans has been the subject of nationwide protests for months. Chicago has been preparing for possible protests ahead of the release the police dashcam video. In Minneapolis on November 23, one of those protests was marred by violence when three white men opened fire at a rally, injuring five people. In the Chicago case, a post-mortem examination showed Laquan McDonald had been shot at least twice in the back. State lawyer Anita Alvarez said Jason Van Dyke had not been justified in shooting Laquan McDonald. She said Laquan McDonald had been carrying a knife when he was stopped by police in 2014 but had not been threatening them or moving towards them. Jason Van Dyke opened fire seconds after he arrived and continued shooting at the teenager as he lay on the ground, the lawyer added. “While we expect officers to do their jobs… there are a few bad apples who go too far and break the law,” she said. Illinois Governor Bruce Rauner has said the video is “very troubling” and he expects a strong public reaction, though he hopes it will be “thoughtful and peaceful”. The police union in Chicago had opposed the release of the video and said it would taint a trial jury. 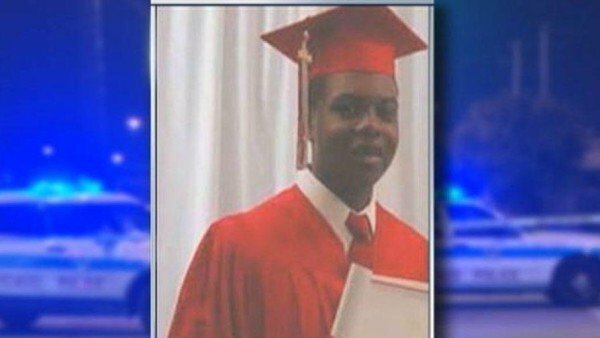 Chicago police say Laquan McDonald threatened officers with a knife and slashed the tires and windows of a patrol car.